The Institute for CSR is a continuing education program designed specifically for CSR professionals. To qualify for the program, applicants must be employed by a company in a CSR-related role. Individuals looking to make a career change into the field of CSR or nonprofit professionals looking to better understand why and how companies give back are not eligible. Corporate professionals whose responsibilities include community involvement, community relations, corporate citizenship, corporate social responsibility, employee engagement, volunteer management, public affairs, and/or corporate communications. CSR teams or departments that want to learn together. EXPLORE key topics and challenges that are shaping the CSR field. GROW the skills you need to meet ever-changing demands. NETWORK with CSR colleagues, national leaders, and independent experts. ACCESS the latest thinking in CSR practice. LEARN how other companies are tackling major social challenges, as well as the practical systems, staffing, tools, and techniques they’re using to achieve results. VISIT leading companies, nonprofits, and neighborhoods in the Greater Washington, D.C. region to apply classroom learning. Discounts are available for multiple attendees from the same company. We also offer flexible invoicing to work with your company’s budget cycles. 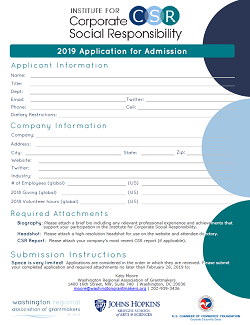 Click here to start your application! Questions? Contact one of our Institute partners.